Zimmer Biomet executives have apparently changed their minds when it comes to avoiding the surgical robotics bandwagon. Medtech's Rosa robotic arm has architecture that replicates the movements of a human arm--with six degrees of freedom. (Image courtesy of Medtech S.A.
Zimmer Biomet CEO David Dvorak wasn't kidding about the company's appetite for acquisitions when he spoke to analysts in April. The Warsaw, IN, company just announced that it will acquire French surgical robotics maker Medtech S.A. for more than $133 million. It's the second acquisition for Zimmer Biomet in as many months. In June, the company announced it would acquire spinal device company LDR Holding Corp. (Austin, TX) for $1 billion. One year earlier, Zimmer and Biomet joined together in their own $14 billion mega-merger. Medtech was founded in 2002 by Bertin Nahum. Its products include the Rosa Spine, a spinal surgical robot that won a PMA from FDA in January 2016. In December 2015, the agency approved the Rosa Brain robot, which the company likened to "a GPS for the brain" and dubbed "the only robotic assistant approved for neurosurgical procedures in clinical use in Europe, the United States and Canada." 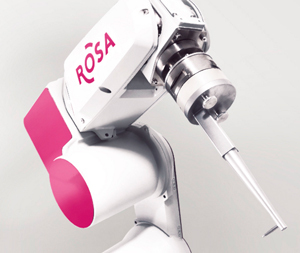 FDA approved the first version of the Rosa robotic arm in 2009. The Rosa device is now present in twenty hospitals in Europe, North America, Asia, and the Middle East, according to Medtech's website. The Medtech acquisition will give Zimmer Biomet entry into the surgical robotics market, following competitor Smith & Nephew's January 2016 purchase of Blue Belt (Plymouth, MN) for $275 million. Blue Belt's Navio handheld, robotic-assisted technology guides the surgeon in creating a virtual surgical plan that removes the need for standard mechanical cutting guides and jigs. As recently as April 2015, a Zimmer Biomet executive said the company would not be jumping on the surgical robotics bandwagon like its major competitors. Apparently, the company has changed its mind. Zimmer Biomet bought 1.4 million Medtech shares, representing nearly 59% of the outstanding share capital of Montpellier-based Medtech, at $55 per share, plus all outstanding convertible bonds and warrants previously issued by Medtech to another investor. Zimmer Biomet will offer to purchase the remaining shares for the same per-share price. Both companies' boards of directors approved the acquisition. French regulators would need to do the same for the purchase to close. Medtech's operations would remain in Montpellier. The Medtech acquisition also represents Zimmer Biomet's second new market entry this year. It joined the cervical disc replacement business with the LDR acquisition, which could also boost its position in the $10 billion global spine market. LDR's primary products are its Mobi-C cervical disc replacement device and MIVo products to support lumbar and cervical fusion procedures.